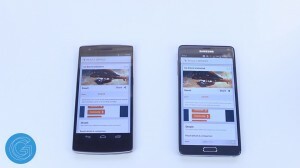 Samsung Galaxy Note 4 vs OnePlus One – Which Is Faster? In this article we’re going to be a doing a full speed test comparison between the Samsung Galaxy Note 4 and OnePlus One that includes app opening, benchmarks, and more. So be sure to share this article with all your friends and check out the video version above. 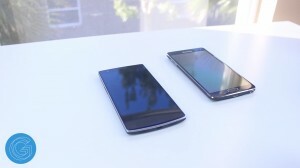 iPhone 6 vs Moto X (2014) Speed Test – Watch Here! Starting off with the specs the OnePlus One rocks the qualcomm quad core snapdragon 801 processor clocked at 2.5GHz processor along with the adreno 330 GPU and 2GBs of RAM. This United States variant of the Galaxy Note 4 on the other hand uses a quad core 2.7GHz Snapdragon 805 processor with the Adreno 420 GPU and 3GB of ram. It’ll be interesting to see how both of these devices software are optimized to use this high end hardware. Anyway, let’s get right into it. First we’ll be doing some real world tests with some basic app opening, swiping through home screens, and whatnot. Both of these devices are on the same WiFi network and they’re both fresh off a reboot so there’s no apps running in the background. Tests like these really are subjective so I’ll let you all be the judge of the winner of this one. The second test we’ll be doing is Geek Bench 3 which is probably the most well respected benchmark testing app on the market. 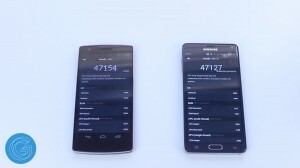 Here we see the Galaxy Note 4 beat out the OnePlus One scoring 3165 multi score and 1101 single core while the OnePlus One finishes with 962 single core and 2155 multi core. Our next benchmark test is Antutu and here the OnePlus One just narrowly beats out the Samsung Galaxy Note 4 by 27 points. The final test we’ll be doing is 3D Mark which is really heavy on both of these devices GPU. 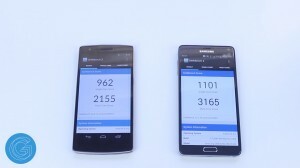 Anyway, here the OnePlus One scores 18489 while the Galaxy Note 4 scores 20066. Anyway, both of these phones are more than capable of handling some high intensity gaming and there’s no questioning they’ll be super smooth with web browsing and all your daily tasks. Be sure to let me know in the comments section which phone you prefer and be sure to share this article with your friends.